I love this cake, it is such a show stopper, deliciously soft banana sponges, filled with wonderfully light Swiss meringue buttercream and then embellished with beautiful amber crystals of nuttiness. This could be made with regular Buttercream if you haven't got time for faffing around with Swiss. You will also need two deep 20cm (8 inch) sandwich tins, greased and lined with a disc of buttered baking parchment. Preheat the oven to 160. Divide the batter evenly between the prepared cake tins and spread level using a palette knife. Bake on the middle shelf of the preheated oven for about 30-35 minutes or until golden, well risen and a skewer inserted into the middle of the cakes comes out clean. Remove from the oven and carefully turn the cakes out of the tins, peel off the parchment and leave to cool on wire cooling racks. Turn up the oven to 190. Make the Swiss buttercream following this link, slice the banana into inch rounds and pop onto a lined baking tray, pop into the hot oven and cook for about 8-10 mins, pop to one side to cool completely. Pour the caster sugar into a large sautéing pan with a splash of water, now gently melt until it becomes a beautiful runny caramel, place the nuts onto a greased baking sheet and pour the caramel over them, leave to cool and harden completely. Once cold break into pieces and either bash with a pestle and mortar or blitz in a food processor. 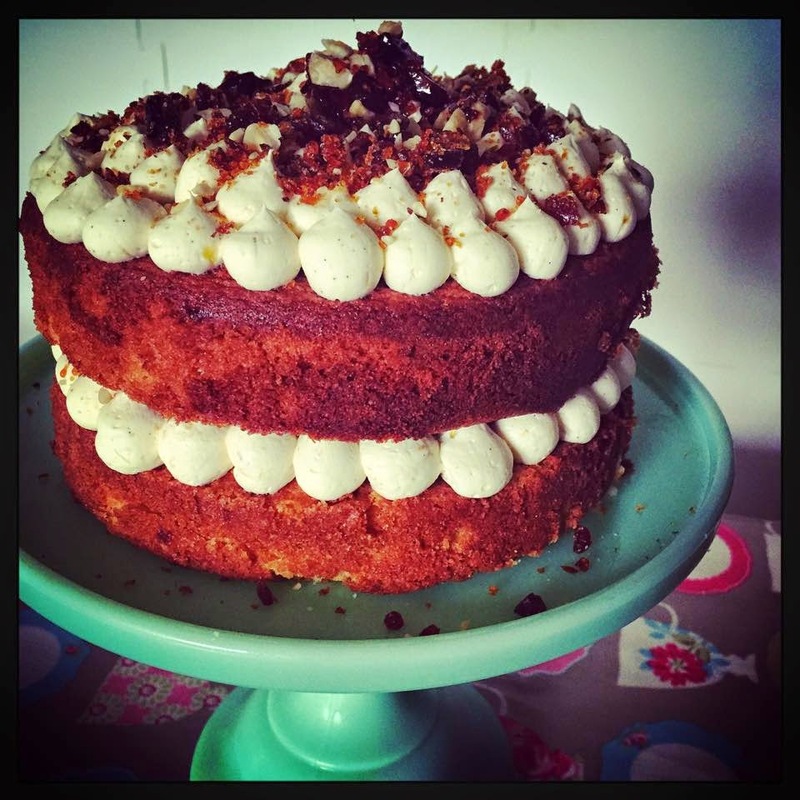 To assemble the cake, mash the cooled banana then fold through the buttercream, spoon into a piping bag fitted with a round nozzle, place the bottom cake onto your serving plate and pipe dots to cover the cake, now sprinkle over about 1/3 of your nut brittle, sandwich together with the remaining cake and repeat the process. *You will have nut brittle over, place in a clean jar with a lid and this is wonderful sprinkled over ice cream.